Max and Jojo at Camp Bonobo in the future Lomami National Park. It all looks different when you are under 25 and coming for the first time to the Lomami. Our youngest daughter, Eleanor (called Jojo), was joined by her good friend, Max, in Congo. Here are tidbits of their perspective on city, forest and camp life in Congo, gleaned from a combined journal that they generously shared along with their great photos. Jojo was born in Congo and lived in a forest village until she was 8 years old when war swept through the east. During Congo’s war she stayed at our upstate New York base and went to American public school while John and I travelled alone to Congo. But Jojo’s last few years of High School were at TASOK, the American School in Kinshasa. Reported here, is her first trip to the Lomami forest. Max and Jojo met as counselors at a summer camp in the Adirondack Mountains. Both of them, they discovered, were attending college in Minneapolis, Minnesota, and, more importantly, they liked each other. 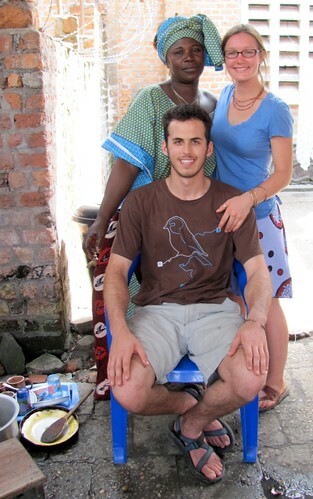 Max had travelled in Europe before, but this was his first trip to Africa –DR Congo, no less! I was already able to get a small taste of Congo. Most of the Congolese on the plane were well dressed. One man wearing thick rimmed glasses carried a brief case in one hand and an electric iron in the other. Most of the women had on high heels. A young man sitting across the aisle from me wore a narrowly cut white suit with a cut off collar and sun glasses. Throughout the flight he sat on the arm rest of his seat talking enthusiastically to a man sitting next to him who seemed, at best, marginally interested. Arrived in Kinshasa, a man in uniform was looking for a “Mr MaxMan”; he found me and helped me get through immigration. They claimed that I didn’t have my yellow fever immunization shots, but I think that was a scam, because I did. Either way, I soon made it through and found Eleanor sitting on the steps outside looking more beautiful than ever. 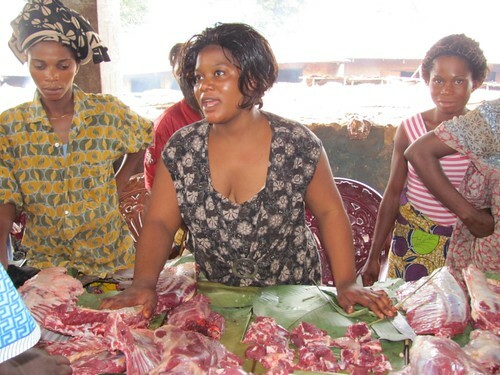 Bargaining for dinner in the Kinshasa meat market. It was especially interesting for me to travel around Kinshasa with someone seeing it for the first time. Max remarked on Congolese lifestyles that I had ceased to notice. He pointed out that everyone put time, money and effort into their hair no matter what their job. For instance, women whacking bloody meat at the market were wearing fancy wigs, a woman sweeping the road verges had amazingly fine and intricate corn-rolls…. Kinshasa airport again: After being questioned about the sunblock, AA Duracell batteries and green water bottle (suspiciously camouflagesque) we passed through security. We were then told that we weren’t on the manifest. We were saved by Michel (Hart’s driver) who crossed and re-crossed the Kinshasa airport, pushing through sweaty and loud crowds until, somehow, he got us on the manifest. Kindu airport: Equally disorganized but smaller, much more laid back and friendlier. We met Salumu, a round-faced confident man who sorted our visas and paperwork as we sat on the luggage counter taking in the scene. Then we took our first moto-bike ride of the trip through the dusty streets of Kindu, to one of several home-bases for the Harts’ TL2 project. The Hart’s base is a little cement and brick house left over from colonial times. There is a living room/dining room, office, courtyard, bathroom and two bedrooms. There is an outdoor kitchen that is Mama José’s domain, equipped with charcoal stoves, several buckets of water and a wooden cabinet. A bamboo wall encloses the house and small yard. There are several chickens and two African guinea fowl which are referred to as Mama’s “kanga”. We spent a long time speculating which was male and which was female. We put our tent in the yard and met a small crew of men some of whom have been working on conservation projects with the Harts for years. The house in Kindu is sparsely furnished, lacks internet, but has other treats such as fruit salad every morning, ever present hot water for tea, juicy lemons and honey. Mama José makes homemade peanut butter and a delicious daily meal. More about Mama José : She is kind, always smiling and delights in caring for the Harts and the TL2 crew. In the kitchen with Mama José. We were in Kindu for two days. We woke up at around 7:30 but were still the last ones up every morning. Through our tent we would hear men in other tents waking as early as 5:30. On our third morning we donned sunglasses, hats and bandannas. We mounted two Yamaha 100s, Dino and Jojo on one and Max and Gillain on the other. We waved good-bye to mama José, the guinea fowl and set off for a village called Tshombe Kilima on the edge of the future park. For about six hours we bumped over sandy paths across savannas, along dirt paths through forests, past small villages and across many streams and narrow rivers. 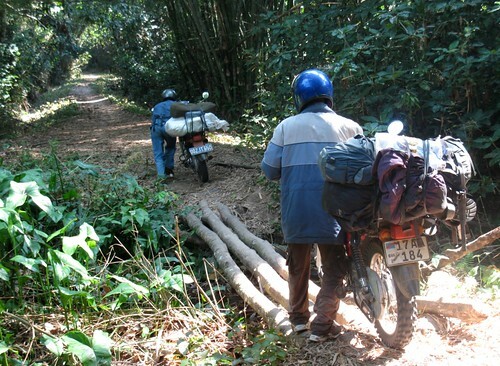 Often we got off as Dino and Gillain maneuvered the “pikipikis” (motorbikes) across log bridges. At the larger Kasuku River, we and the “pikipikis” took turns crossing in a little dugout. Taking the “pikipikis” across a small bridge. Part-way through the trip we stopped and bought delicious bananas and oranges by the side of the road. Thankfully we ate several bananas on the spot because by the end of the trip they were a grey mush. And the bananas were not alone in suffering. Although the pikipiki ride was an exhilarating way to see a lot of country, towards the end our butts and Max’s knees were pretty sore. We were warmly welcomed at Tshombe Kilima, and introduced immediately to a large group of men; probably most of the village had come to see us. We were served tea and roasted manioc. Jojo felt shy and wished her parents were there to do the talking. The camp at Tshombe Kilima is well organized : two dirt buildings, an outdoor paillote (leaf roof but open walls), and outdoor kitchen all surrounded by bamboo walls. One side opens into the village and the other side, where there are two outhouses and bathhouse, opens into the forest. We set up our tent and then walked to a small nearby river for a rinse. The water was black and cool and beautiful, but we were both afraid of crocodiles. We dipped in and out as quickly as we could. We were upset with each other at the time, but in hindsight it was very funny: Both of us scared and arguing about crocodiles while standing nearly naked on the banks of a peaceful forest stream. There were seven of us: Dino, Max, Jojo, Shindano and three other porters, one of whom was called “General”; however, since he kept falling behind, Dino and the others started calling him “Colonel”. It was a great group of people. Shindano is small and always smiling. Dino is easy-going and very considerate. We walked about 25km each day. The first day’s walk seemed to fly by, through forest and a big savanna island. 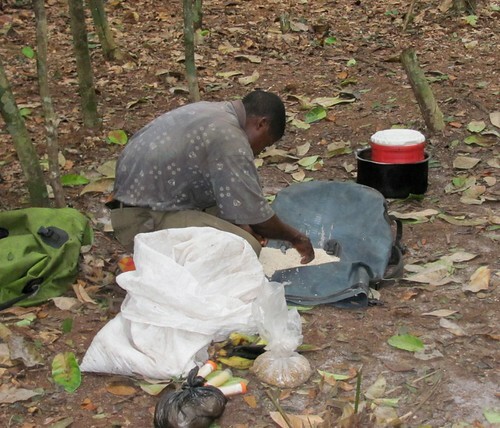 Before we reached the savanna, Shindano brought out a breakfast of sardines and shikwong (manioc that denatures a bit through putrefaction before being dried, pounded and made into a hard but flexible paste). Max (second from right) strides across the first savanna island. We had never seen anything like the savannas before. The soil was white and sandy, but such a variety of grasses and birds! At places the path was deep and narrow; we walked one foot in front of the other and as quickly as possible to escape the sun and reach the cool forest on the other side. When we arrived we were drenched in sweat and very thirsty. Shindano carried a chicken the first day that he cooked that night where we camped in the forest on the banks of the Luidjo River. Chicken and onions on rice – it was delicious. Shindano cleaning rice at the camp on the Luidjo river. We bathed in the Ludjo, too tired and sweaty to fear crocodiles and then fell asleep to an orchestra of forest insects. The second day’s walk, to camp Katopa seemed longer. 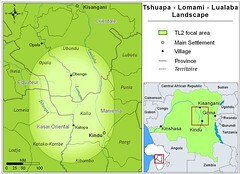 We crossed two large savannas and arrived at the Lomami tired but excited. Shindano bellowed and soon a large dugout was headed across the fast-flowing river to bring us to Katopa camp. Men gathered along the shore to greet us – enthusiastic hand shaking and shouts to announce our arrival. We were ushered to a paillotte where we drank sweet tea and took our wet shoes off wrinkly, white feet. There were chickens and ducks wandering around freely and several tents set up for men taking a break from the field camps. We quickly set up our tent too , then took a bath in the Lomami before dinner of sombe (manioc greens), chicken, rice and more tea. To bed early. 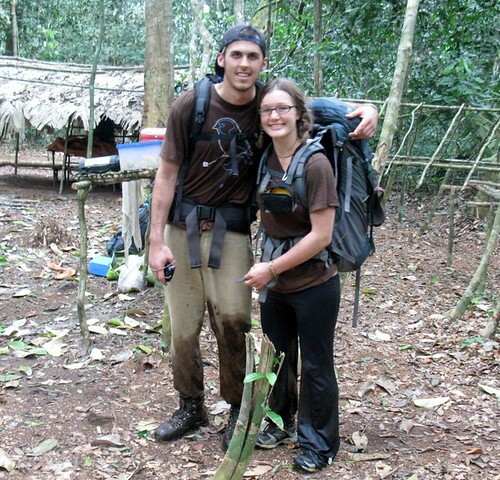 Jojo and Max spent a week at the field camps, each only a couple hours walk from Camp Katopa. Now they are both back in Minnesota. And, hey, they are welcome to come again — anytime. A few more photos of their trip. This entry was written by Terese Hart, posted on 2010-07-18 at 4:23 pm, filed under About the project. Bookmark the permalink. Follow any comments here with the RSS feed for this post. Post a comment or leave a trackback: Trackback URL. Wonderful post Terry–great to see and to read! I’m glad you’re enjoying the post. The Lomami forest is extraordinary – a landscape neither Max or I had ever seen before. The abrupt transitions from savannah to forest were especially dramatic, but even while walking through the forest one changes from swamp to dry forest just by walking up a very small hill! I especially enjoyed the many streams that we crossed. Usually the water is a deep rust color, and the sandy bottom and depth of the water is perfect for taking a little dip! Really loved reading this! The immediacy and honesty of description is so evocative. Are you by any chance in the IPS meeting in Kyoto? I am! I think you might be here already, and would love to catch up. Sorry i haven’t emailed before, i just got back from the field literally 2 weeks ago and have barely had time to unpack. Will give a talk on bonobo play and intergroup encounters tomorrow Tuesday at 3 pm but otherwise free to meet anytime, hope i find you! So wonderful to see your picture, Jojo…You are in Chuck’s and my thoughts often. And, look at you all grown up!! This is what I was hoping to find when I signed up to work at TASOK in 1971. Instead, I landed in a nest of Evangelical Missionaries who were mostly Southern, Racist, and wanted to recreate Middle America in Central Africa.